The first and most important step to securing a system is to change the default password. We have seen many instances of systems exposed to the Internet being compromised simply because the password has not been changed, and has been guessed by a dictionary attack. On the web interface, visit the User→ Change password menu entry. On the command line, either via SSH or serial port, log in as root and run the command passwd. This will prompt you to enter a new password, asking twice for confirmation, and then it will update it. This password is used for web, SSH and serial port access. There are two protocol servers running on Platinum which, by default, allow unauthenticated access to instruments in various forms. Most importantly, the Scream server (which at present cannot be disabled) will allow any TCP client full access to an attached DM24 module. The configuration of the attached Platinum module cannot be altered, but the firmware and configuration of the DM24 can be. In addition, it is very easy for a TCP port scan to accidentally activate terminal mode on the DM24, as the protocol requires only a single byte to be transmitted to do so. 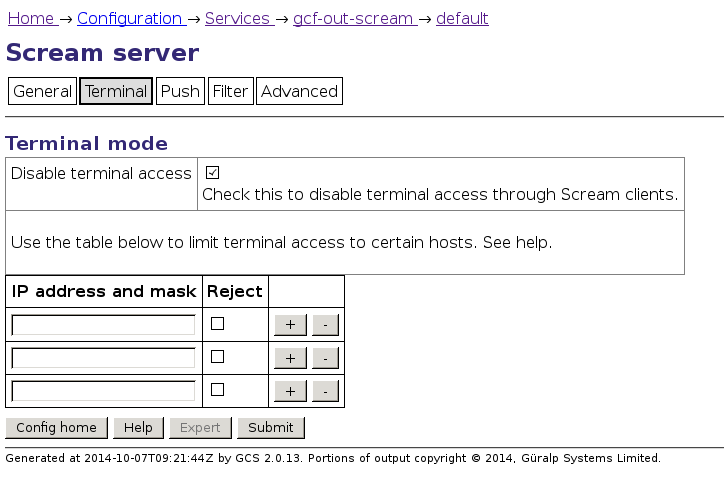 As this screenshot implies, terminal access can also be restricted by source IP address. TCP access can also be restricted by firewall, but note that TCP access is required for the Scream protocol to work properly (even in UDP mode). Terminal access is logged under /var/log/libterminal (and the files there can be examined with the dump-serial-log command). 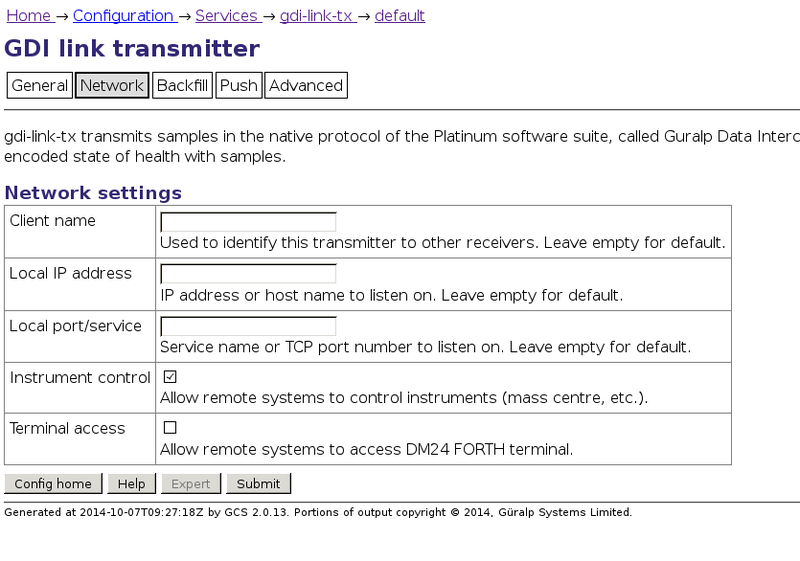 Secondly, the gdi-link server allows sensor control (lock, unlock, calibration etc.) by default. This cannot be accidentally activated; negotiation is required and the command structure is not trivial enough for accidental activation. By default, raw terminal access is disabled through gdi-link (though it could be enabled). These more secure defaults were introduced in Platinum release 13664. Again, sensor commands are logged through /var/log/libterminal and TCP access can be locked down using a firewall. Please note: users familiar with configuring OpenSSH should feel free to modify the SSH server configuration files in /etc/ssh.local to match their desired configuration. Older Platinum systems will have shipped with SSH protocol version 1 (SSHv1) enabled. This is no longer recommended, as the protocol is not secure by today's standards. SSHv1 should be disabled. On the command line, open the file /etc/ssh/sshd_config in either vi or nano, and find any line containing the word Protocol. If missing altogether, or commented out, then SSHv1 is already disabled. Otherwise, change the line to read Protocol 2. This ensures that only version 2 of the protocol can be used. SSH keypairs can be used in lieu of passwords to authenticate users. This method is both safer (the private key contains much more "entropy" or randomness than a password does, so cannot realistically be attacked using only brute-force) and more convenient, because it does not require entry of password at every login. In this technique, the client generates a public/private keypair. The public key is safe to distribute and does not need to be kept secret. It must be installed on each server to which access should be granted. The private key must be kept secure. Only users with access to the private key can log in to servers where the public key has been installed. This asks for a filename; the default it suggests is the file that the ssh command always tries to use. It may be sensible to choose another name (e.g. ~/.ssh/id_guralp). It also asks for a passphrase. This is used to encrypt the private key on disk in order to keep it secure. The passphrase can be omitted (just press enter), which is suitable for automatic scripts etc. but, for a user key, we recommended that you provide a passphrase. 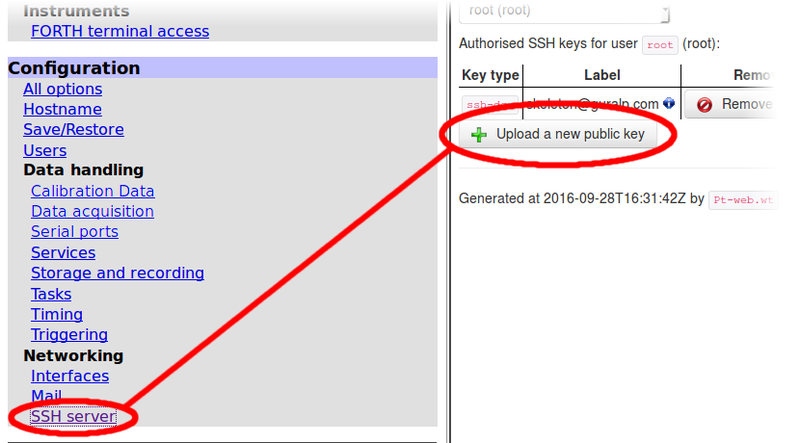 To install the public key (which is a plain text file consisting of one long line), it must be added to the file /root/.ssh/authorized_keys. By default, this file contains the Güralp Systems skeleton key, which allows our support team to log in without needing a password. This key can be removed at your choice, but this disables the utility of the remote-assistance tool. To add the key, use a web browser to visit Configuration → Networking → SSH server. In the resulting screen, click and use your browser's standard upload dialogue. If SSH keypairs are deployed and all users are trained in their use, then it is sensible to disable password-based login. This completely prevents dictionary attacks, since only the pre-authorised private key files can be used to log in. can be edited to replace the built-in certificate with a new one. This file also contains the private key. Getting such a certificate is beyond the scope of this document, and probably requires a network administrator with knowledge of the CA system and processes. If desired, it is possible to prevent HTTP access altogether using the built-in firewall. See the section on the firewall below for details. Rate-limit inbound SSH connections from unknown addresses, or lock down completely to known sources. Prevent inbound HTTP, only allowing inbound HTTPS. Inbound UDP and TCP are required to port 1567 (default) for the Scream protocol. Inbound TCP to port 1565 (default) is required to retrieve data via gdi-link. Inbound TCP to port 1566 (default) is required to push data to the target system via gdi-link. Do not forget to secure IPv6 with the same rules as well. Outbound connections to port 873 of rsync.guralp.com, for firmware upgrades. Outbound connections to port 80 of www.guralp.com, for periodic leap second table updates. The save option will save any rules added or modified using the iptables/ip6tables commands to persistent configuration storage. This would normally happen as part of a clean reboot process, but not on an unexpected reboot/power outage. The reload option reloads the set of rules as last saved to persistent storage. The clear option clears all current rules, but does not immediately save this. The firewall rules are saved under /etc/iptables.local and removing the files in that directory will remove the firewall rules on the next reboot. Starting in firmware build 14187, the web interface has a tool to view the state of the firewall, and flush the rules if necessary. This tool is available under the "Troubleshooting" menu link: simply click the "Firewall diagnostics" button. This example shows our recommended rules if a border firewall is not present. These can be adapted easily, and should be entered in the order they are shown. Further web searches on the iptables tool may provide additional information for further tailoring the firewall. ip6tables -A inbound_ssh --src fe80::/64 -j ACCEPT    # IPv6LL: recommended! Note that you can add further addresses at any time with any number of further iptables -A inbound_ssh commands. Be sure to add your own address before the REJECT rule if entering these rules over SSH! If desired, specific hosts can be whitelisted for HTTP using an iptables -A inbound_http command similar to that used in the SSH example.